David and Goliath did not disappoint. It is evident to any reader that Malcolm Gladwell knows what he is doing. The book's objective is to tackle the underdog theory and turn it on its head. 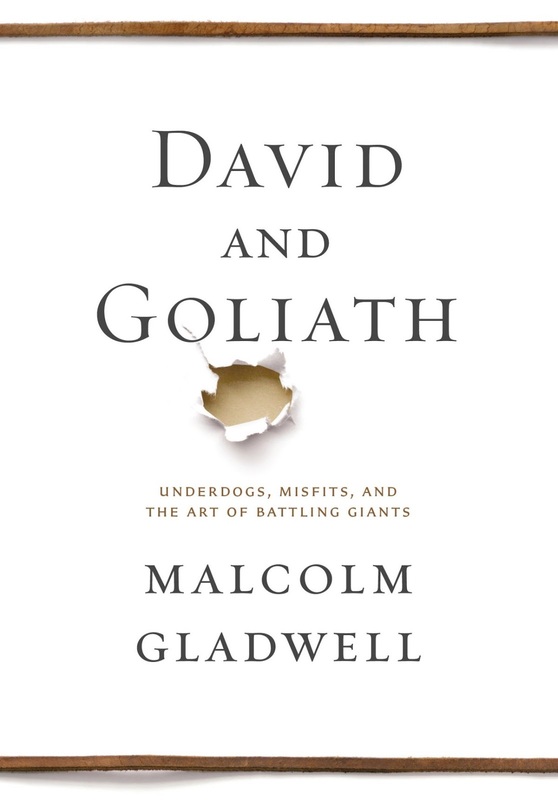 As the above quote indicates, Gladwell begins by adding a new perspective to the Biblical story of David and Goliath. Gladwell positions David as a wise youth who devised a way to parley his powerful slingshot skills and upset the playing field against a giant. Gladwell argues that David's triumph was not at all improbable but made perfect sense. Once readers understand the power within rereading one's abilities and challenging the status quo, they can understand Gladwell's argument that sometimes a weakness isn't a weakness at all--it's an invitation to realize a latent strength. A number of points within the book alter standard perceptions of advantages versus disadvantages. 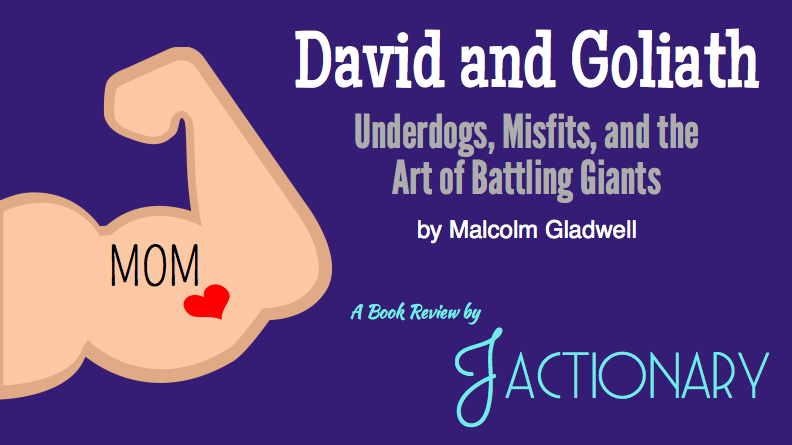 Though Gladwell certainly does not wish difficult circumstances upon anyone, he convincingly shows how traumatic childhoods, learning disabilities, or being at a great disadvantage can be used as a tool for turning a seeming underdog into a hero. His narrative seamlessly guides readers through facts, numbers, and a massive amount of research without leaving the audience feeling bogged down. I was particularly struck by Gladwell's discussion of classroom size and reconsidering the value of ivy-league education. While most of the U.S. education system has begun prioritizing smaller class sizes, Gladwell argues that school rooms with fewer students don't necessarily lead to greater student success; in fact, in some cases small classroom size can be extremely detrimental to student achievement. Regarding student success and ivy league schools, Gladwell's research finds that it's far better to be a big fish in a little pond rather than a little fish in a big pond. Students who had achieved amazing academic success prior to their entrance to some of the U.S.'s most competitive programs often faced such competition and discouragement in these environments (despite their high level of expertise) that they left the area of study altogether, depriving our country from some of the brightest minds in many leading fields. Had these students attended slightly less competitive programs, they would have benefited from an increased level of confidence. The book was immediately engaging and changed my perspective on several points. I read Outliers a handful of years ago and felt the same way--sharp and well-researched writing that invited me to consider things in new ways. I've since read and enjoyed What the Dog Saw (a book review on that is likely forthcoming) and hope to read Blink and Tipping Point soon.